BANGKOK, 17 July 2014 — Mr. Sumate Mahosot, the Director General of the Department of Employment, reports that the Embassy of the Kingdom of Cambodia in Thailand has issued notices to laborers who come to work illegally in Thailand to be aware of four issues. All Cambodian workers have to register at a One Stop Service Center in the Thai province where they work. After the registration at a One Stop Service Center, workers with a passport have to submit a request to extend their stay in the Kingdom of Thailand and apply for a permit to work in Thailand. 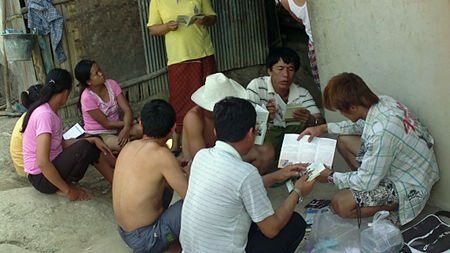 Workers without a passport, after the registration at a One Stop Service Center, have to make a request for a passport from Cambodian officials, then submit a request to extend their stay in the Kingdom of Thailand and seek a work permit. The Ministry of the Interior of Cambodia will provide passports at four centers in Cambodia namely Poipet Center, Pailin Center, Chamyam Center and Osamet Center. If any Cambodian workers are not allowed by their employer to go for a registration, they should contact the Embassy of the Kingdom of Cambodia in Thailand by calling 098-4041-550 or 082-7990-007. Moreover, the Director General of the Department of Employment also disclosed that on Friday afternoon, July 18th, Mrs. Eet Sophi, the Cambodian Ambassador to Thailand, will come to discuss the registration of Cambodian workers.